Quirky, strange, polished, these words can be used to describe Yamaha’s GTS1000A – a hub centre-steered oddity. In these days of instant gratification there’s an ever increasing obligation to assess stuff, well, instantly. But the modern way of drawing a conclusion from first impressions definitely isn’t advised with Yamaha’s GTS1000. No, understanding this bike needs a considerably lengthier term. My run on this one came a bit out of the blue. I’d nipped along to the HQ of the Yamaha FJ Owners Club in Wiltshire to meet boss Phil Hacker. The plan was to test a selection of his bikes, but I hadn’t really expected to get to sample the hub centre-steered 90s classic. When I did get aboard it, I almost wished I hadn’t. For all its fascinating technology (which made us all think it was ahead of its time in 1993), I couldn’t help but sneer in disapproval. Okay, so it still stands out, but what a huge and heavy motorbike! Any supposed advantage of the funny front-end, helping to isolate the suspension from braking forces and maintain consistent chassis geometry, seemed purely academic. The GTS just felt like some dated, overweight has-been (a bit like me). I reckon there’s little point in featuring any clever techy stuff if what it’s attached to seems so basically flawed. No wonder the bloody thing had failed completely and sold in very small numbers (just 300 in 1993 alone and the web shows just six in the UK). Let’s face it, if you can’t get the design basics right then there’s no chance of creating success. Mind you, I’d wager costing nigh-on ten grand was by far and away its biggest turn off all those years ago. As I was to discover, the GTS is an alternative sort of bike, needing time to appreciate and savour. More and more minutes and miles are essential to give a chance of delivering a fairer, fuller and more accurate assessment. There’s quite a bit to get your head round, and getting to grips with it all isn’t a quick deal. Quite naturally the fork-less bike is bound to feel quite unlike stuff of a more usual design. 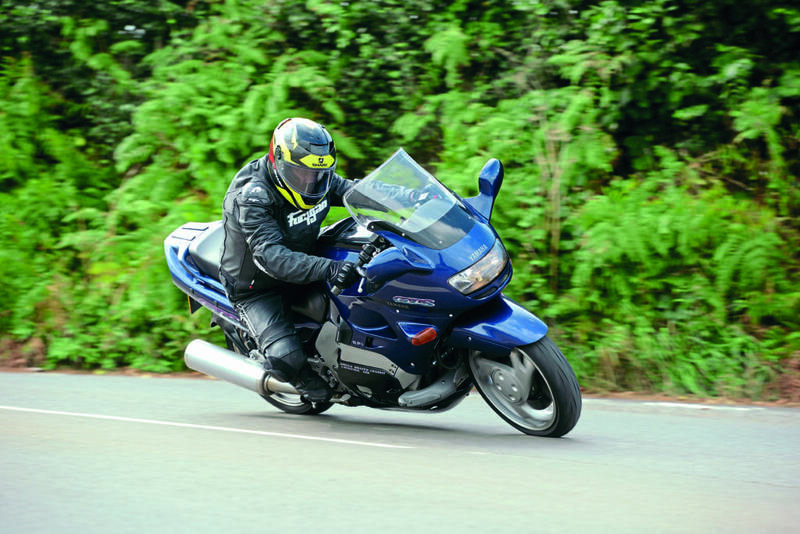 There’s a different sensation to the steering and front suspension, and one of the reasons it’s unfair to weigh the bike up with just a quick spin. What I did give the thumbs up to soon after the off though, was the engine. 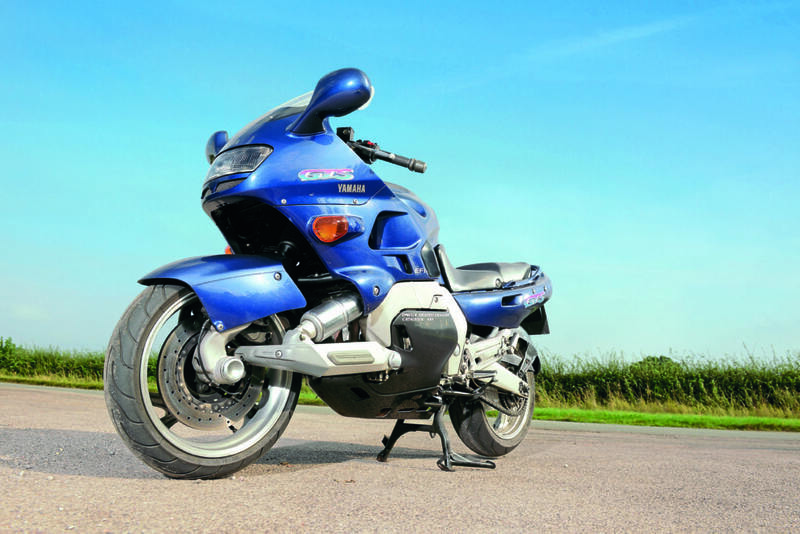 The detuned FZR1000 motor is super-usable and a real asset to the bike. I’ve become less and less of a fan of revvier inline fours in recent times, but the grunt of this one had me singing its praises virtually from the first time I opened the throttle. Its claimed peak power of just 100bhp doesn’t sound like much to shout about, but the combination of the softer cams, smaller bore intakes and header pipes, along with a lower compression ratio, all help the motor to deliver its impressively strong low rpm and midrange drive readily and usefully. The Yamaha only has five gears, but could probably cope with even fewer thanks to how broadly spread the power and torque is. It’s an unhurried and very flexible friend, and just doesn’t need lots of revs and gear changes to reliably gain and maintain pace. Just as welcome is the engine’s sophisticated and super-smooth feel. Add in a very linear style of power build up and it’s impossible not to like. It’s just the job. A few words of approval for the GTS’s fuel-injection system are well warranted too. In short it works seamlessly with no quirks to tolerate or have to ride around. For a set-up as old as this one that really is saying something. 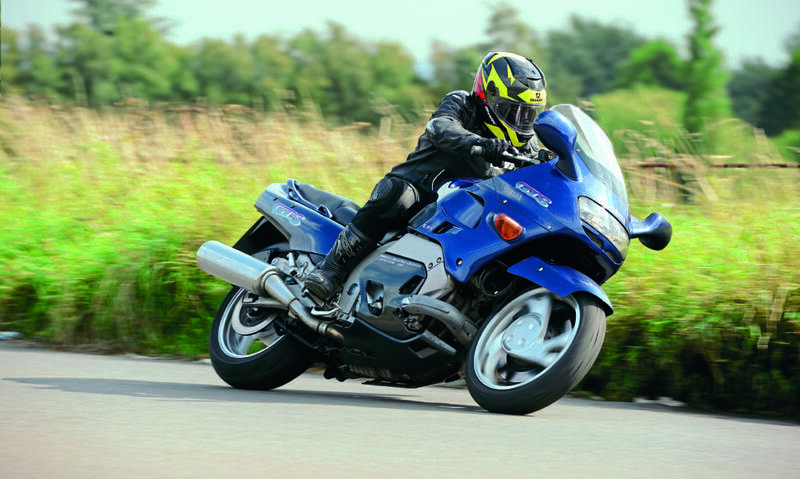 Back in 1995, injection on bikes was still in its infancy, especially on Yamahas. Another advantage of the Yamaha’s all-round appeal and usability is its comfort: the riding position isn’t at all cramped, wind protection is decent, and the seat seems good enough to stay in for many an hour. Owner Phil has been down to Portugal a few times on it and not ached once. Thinking back to my ride, the GTS felt solid as a rock while still dealing with bumps as well as a magic carpet. To carry on reading, you can purchase the April 2018 edition for the whole feature with plenty more expert knowledge and more pictures! Just click here!